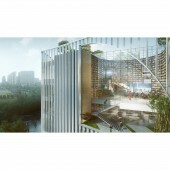 Shenzhen Book City Cultural space and library by ATELIER GLOBAL LTD.
Our design aims to rejuvenate this district in Shenzhen by making the architecture an interlocking system of cultural spaces. A network of vertical terraces further enhances the living quality. Facade is composed of vertical shading devices to filter sunlight at different angles that also reminds the dynamic condition of flipping a book. Interior design creates vertical dialogues among different programs. 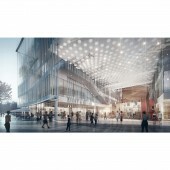 The new Book City is a dynamic and responsive architecture, located at heart of Long Hua district amongst an art centre, public park and urban villages. Through its unique and bespoke spatial arrangement, it creates identity and provides a brand new interactive environment open to the public. Different cultural activities happen at different corners of the building, book program and flexible cultural space interact with each other without the restriction of time and space. 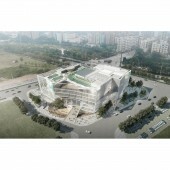 1 year design period, target completion and opening year is 2020. located in Long Hua district, Shenzhen. Client: Shenzhen Government Design Firm: Atelier Global Limited; Client: Shenzhen Publication & Distribution Group. Atelier Global is a young and aspiring practice that has strong belief in the power of design and creativity. We regard architectural design as quintessential to living environments that constantly encounters new and emerging needs. Hence we are not bounded by a conventional modernism approach with a singularity concern on differentiation of space and function. Rather, we always search for possibilities that may not be easily foreseen, and create projects with new insights by establishing various seemingly unrelated cross links to different project types, scales and spaces. Our systematic yet trans-boundary approach on design has been successfully applied to comprehensive project types including culture, education, hospitality, living communities, retail and working spaces. All of our projects are executed with critical attention to details and our completed projects have received renowned recognition from the professional industry. Atelier Global has received numerous design awards from Hong Kong and Cross-strait professional institutions and is actively involved in academic and cultural research including design Biennales and university teaching. Shenzhen Book City Cultural Space and Library by Atelier Global Ltd is a Nominee in Architecture, Building and Structure Design Category. · The profile and other works by ATELIER GLOBAL LTD. is also kept secret. This information will also be available later. 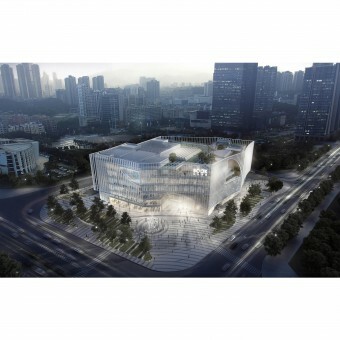 Shenzhen Book City Cultural Space and Library by Atelier Global Ltd is Winner in Architecture, Building and Structure Design Category, 2017 - 2018. · Press Members: Login or Register to request an exclusive interview with ATELIER GLOBAL LTD..
· Click here to view the profile and other works by ATELIER GLOBAL LTD..
Did you like Atelier Global Ltd's Architecture Design? 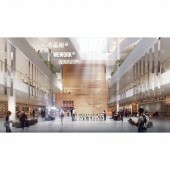 Did you like Shenzhen Book City Cultural Space and Library? Help us create a global awareness for good architecture design worldwide. Show your support for Atelier Global Ltd, the creator of great architecture design by gifting them a nomination ticket so that we could promote more of their great architecture designs.